By Dan SteinbergAmid continuing criticism of their team name, the Washington Redskins have launched a new campaign to defend the moniker, headed by popular former players who traveled to Indian country this week. 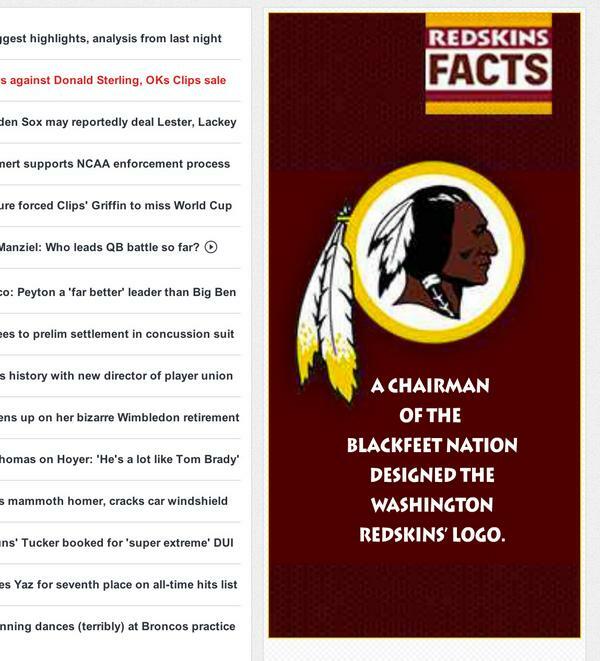 Ads for a new site, RedskinsFacts.com, have begun appearing on the web sites of Sports Illustrated, the Washington Times and The Washington Post in recent days. The group’s Web site lists a five-man steering committee of former players—Gary Clark, Chris Cooley, Mark Moseley, Ray Schoenke and Roy Jefferson. Some critics of the name, Moseley said, “don’t know what they’re talking about. They’ve done no research. They’ve never talked to an Indian. They have no knowledge of what Redskins really stands for. They just heard someone say this is like the N-word, and all of a sudden people jumped on the bandwagon and said it’s racist, and that’s ridiculous. By Paula MejiaWashington, D.C.’s resident football team has been under fire for its name, which—according to most major dictionaries—is a derogatory slur directed against Native Americans. Yesterday the team launched a new site playing up its history and validating its name. “We at RedskinsFacts.com contend that the name is a self-reference in the context of the football team itself—and in no way should it be considered a slur targeted at a specific ethnic subgroup of Americans,” the site says. The site features sections dedicated to positive media coverage and favorable facts. Former team members and Native Americans, who claim to not mind the name, appear in videos. The homepage features 2004 study conducted by the Annenberg Policy Center of the University of Pennsylvania, which reportedly found that 90 percent of Native Americans surveyed nationwide about the team’s name didn’t find it offensive. It also notes an Associated Press survey from earlier this year that found 83 percent of Americans wanted to keep the name. But several questions have been raised. The Annenberg survey fails to specify who participated in the Native American citizens poll: Was it only people who were registered with a tribe, or people who are partially Native American? Who's really behind the "growing online community"? By Mary Elizabeth WilliamsThis week, ads on the Washington Post and Sports Illustrated sites began trumpeting the new outpost for “a growing online community of passionate Washington Redskins fans and others” and vowing to offer “historical evidence to fair-minded opinion leaders on both sides of the issue so ongoing discussions can be constructive.” That community, however, is so far made largely of its official sponsors, team alumni Gary Clark, Chris Cooley, Mark Moseley, Ray Schoenke and Roy Jefferson. Speaking to Slate Tuesday, team spokesman Tony Wyllie did not directly state how the site was being funded, but declared, “The alumni and the Redskins have a long history of supporting each other and this education effort is no different. So where it is appropriate for the alumni to pay for expenses then they will and when it is appropriate for the Redskins then the organization will. Since it is so early in the education effort there is no easy breakdown available.” Slate also notes the compelling connection between the site and Burson-Marsteller, a P.R. firm that touts itself as one to call on “when the stakes are high: during a crisis, a brand launch or any period of fundamental change or transition.” And Deadspin further finds that among the first followers of the site on Twitter were Burson-Marsteller employees. Smooooooooth. Let’s take a gander at this “education” effort anyway. In a video on the site, Tony Woods, a member of the Chippewa Cree Tribe and manager of the Team Redskins Rodeo club, says, “I’m offended, really, that somebody’s out there claiming that they speak for me … There are bigger issues to deal with than a name.” The team’s foundation, by the way, sponsors the rodeo club, and has provided iPads for the reservation’s schools. And there’s more. As writer Jesse Berney pointed out Wednesday on Twitter, nothing’s so convincing as “a photo of white dudes yelling and shaking their fists to prove our team name isn’t racist.” I’m fond of the “We’re all Redskins” on game day image—featuring a sea of white arms. And there’s the site’s explanation that “We believe the Redskins name deserves to stay. It epitomizes all the noble qualities we admire about Native Americans—the same intangibles we expect from Washington’s gridiron heroes on game day. Honor. Loyalty. Unity. Respect. Courage. And more.” That sums up Native Americans. In general. Did you know that there are 566 federally recognized American Indian tribes and Alaska Natives in the U.S.? Did you know that different social and ethnic groups have different traits, or that sweeping generalizations that put separate groups under one label, even when those generalizations are favorable, are still kinda dumb and insulting? The “facts” go on to argue that “the Redskins name is a self-reference in the context of the football team itself—and in no way should it be considered a slur targeted at a specific ethnic subgroup of Americans.” And if you do consider it a slur, you’re wrong! I haven’t seen this much boastful ignorance since HuffPo decided it’d be cool to do a slideshow of “Proof That Once You Go Black, You Never Go Back.”Who’s Behind the New Washington Football Team Website? The team wants you to think there's a grass-roots movement in support of its offensive nickname. The site’s source code suggests otherwise. By Josh Levin and Jeremy StahlWho is behind this site, which has a stated mission to present “historical evidence to fair-minded opinion leaders on both sides of the issue so ongoing discussions can be constructive”? The About Us page indicates that it is “a growing online community of passionate Washington [NFL team] fans and others who support the team’s use of its name and logo.” A Washington team spokesman told the local ABC affiliate WJLA that “they know of the site and totally support their effort,” sounding surprised and delighted by this online campaign. While that statement is not dripping with clarity, we do know that Washington owner Daniel Snyder has in the past enlisted mouthpiece-for-hire Lanny Davis to stump for the team's nickname. This new, probably-not-grass-roots website also appears to be part of a PR operation. This one bears the fingerprints of Burson-Marsteller, a communications firm best known for its crisis management services. Burson-Marsteller has done PR work for, among many others, the manufacturer of the Three Mile Island plant, Johnson & Johnson (in the wake of early-1980s Tylenol poisonings), and military contractor Blackwater USA. The firm’s crisis management page also notes “The Lady Gaga Concert Debacle” as a representative case study. By ReutersThe National Football League's Washington Redskins have hired public relations firm Burson-Marsteller as it battles criticism that its name is a racial slur, a company spokeswoman said on Wednesday. The company, which has long experience handling public relations crises, will run the website redskinsfacts.com. The site was launched this month and is billed as a grass-roots effort to defend the team's contentious name. Comment: I'm not sure the Washington team can do anything but lie. They certainly haven't told the truth about the widespread Native opposition to the dictionary-defined racial slur.